Smallville and Stargate Universe come to an end, and Neil Gaiman writes Doctor Who! This week's television sees the last ever episodes of Smallville and Stargate Universe. Will Clark become Superman in time to save the Destiny? Plus season finales of Adventure Time, Vampire Diaries and Community. Orc Bikers! Daffy Duck's social climbing! Ghost-angst! But quite possibly the most interesting bit of television this week is the premiere of Neil Gaiman's Doctor Who episode. We've got a clip and the official synopsis below. Here's your indispensible guide to the week's television. Syfy is showing Stargate Universe all day long, so you can mourn properly. The Problem Solverz are enlisted by the delightful Sweetie Creamy to stop her father from blowing-up his own ice cream factory. Meanwhile, Horace is under Sweetie's spell – or is it her hypnotic ice cream? Check out a clip above! Chuck (Zachary Levi) and Sarah's (Yvonne Strahovski) wedding prep includes one final detail: ensuring that the mother-of-the-groom (guest star Linda Hamilton) makes it to the ceremony alive. Meanwhile, Morgan's (Joshua Gomez) responsibilities as Best Man include his most dangerous mission yet, as he faces Vivian Volkoff (guest star Lauren Cohan). Elsewhere, Ellie (Sarah Lancaster) tends to the last details of the rehearsal dinner and seeks help from an unlikely source. Also at 8 PM: A new House on Fox, in which there will be miraculous medical deductions and weird quasi-science. At 9 PM, NBC has a new episode of The Event, "One Will Live, One Will Die." I love the idea of the Vice President calling in an air strike to stop someone bringing an antidote to the President. With doubt still surrounding the tragedy at the White House, Sterling (Zeljko Ivanek) encounters an unlikely ally in Simon (Ian Anthony Dale), who risks his life to return with a possible antidote. Against the wishes of Chief of Staff Richard Peel (guest star Roger Bart, "Desperate Housewives"), Jarvis (Bill Smitrovich) authorizes an air strike to neutralize them. Meanwhile, Sophia (Laura Innes) continues on her diabolical plan to exterminate the human race, now with the help of an unwitting accomplice — Leila (Sarah Roemer). Elsewhere, Sean (Jason Ritter) and Vicky (Taylor Cole) try to prevent the deaths of many thousands of innocent people. Operation Dinner Out Redux? Will and Henry just want to get away for a quiet evening of double-dinner dating, but Magnus insists that they drop off a small crate at the docks while they're at it - which is fine, until the abnormal inside insists on breaking out and flying away. It's Sanctuary's turn for a marathon on Syfy. The "Wild Brood" (a gang of bikers that look like Orcs) comes to town. Daphne and Velma hang out with them for a while. When the Crystal Cove Armory is broken into and a rocket launcher is stolen, the bikers are suspected. The Royal Oaks Glenn Oaks Oakwood Oaks Country Club (or RO GO OO CC as it's known to insiders) is very exclusive and membership comes at a high price. Daffy, of course, finds the means to swindle his way in, bringing Bugs along to partake in all the perks. Bugs meets a new lady friend, Lola (voiced by Saturday Night Live star Kristen Wiig), on the tennis court, and quickly becomes enmeshed in an inescapable one-sided relationship that proves to get Daffy in the biggest trouble of all. Everyone's favorite Casanova skunk, Pepe LePew, debuts in "Members Only," and Marvin the Martian is the star of this week's Merrie Melodies music video. This week also marks the small-screen premiere of the CGI Wile E. Coyote and Roadrunner shorts, adding a good dose of slapstick humor at the end of the episode. Jamie and Adam travel to Los Angeles to examine some of Hollywood's acoustic secrets. The guys attempt to compare sounds fabricated for the silver screen with actual sounds that occur outside of production studios. In true MYTHBUSTERS fashion, the pair seizes the opportunity to extract sounds from rattlesnakes, punches, silencers and, of course, explosions. Back in Northern California, Kari, Tory and Grant take on both Newton's Law of Motion and cartoons that depict characters being propelled forward by electric fans. The crew puts this myth to the test by attempting to use fans to power small- and large- scale vessels, as well as an awesome jet powered skateboard. Also, the third episode of South Park season 15 is on Comedy Central at 10 PM. Today's Syfy marathon: Invasion. And then the usual Star Trek: TNG marathon in the evening. Once again, NBC has the season finale of Community at 8 PM, at the same time as a new Big Bang Theory on CBS. On Community, it's the second half of the paintball two-parter, while Big Bang Theory is all about Howard's mom reacting to his engagement to Bernadette. While Mystic Falls presents a screening of "Gone with The Wind" in the town square, Damon's (Ian Somerhalder) memories of Katherine (Nina Dobrev) in 1864 mix with the reality of Elena (Nina Dobrev) in the present day. Stefan (Paul Wesley) pays a terrible personal price for his attempt to prevent a tragedy, and Sheriff Forbes (Marguerite MacIntyre) makes a deadly mistake while trying to keep everyone safe. More than one life hangs in the balance as the consequences of the sacrifice ritual play out to a horrifying conclusion. Also at 8 PM, the season finale of Naked Science on National Geographic, "The Molecule that Made The World." Then at 9 PM, National Geographic has another episode of Known Universe, "Treasure Hunt." And now it's Star Trek: Enterprise's turn to have a marathon on Syfy during the day. The story of Clark Kent (Tom Welling) culminates in this epic two-hour series finale as Clark takes the last step to becoming the Man of Steel. With surprise guest appearances, nods to the first few seasons of the series and Michael Rosenbaum's return as Lex Luthor, this final episode wraps up a decade-long story following one's man's journey to becoming the world's greatest superhero. Or if that doesn't float your boat, Investigation Discovery is celebrating Friday the 13th with an evening of programming dedicated to real-life vampires and serial killers, including Pig Farm, American Occult: Blood Lust, and Lore: Deadly Obsession, a two-hour docudrama about the "Vampire of Sacramento." It all starts at 9 PM. At 10 PM, Camelot is back on Starz. The Doctor receives a distress signal from an old friend. 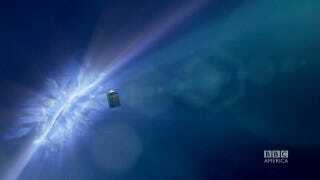 Could there be another living Time Lord out there? Hopes raised, he follows the signal to a junkyard planet sitting upon a mysterious asteroid in a Bubble universe, populated by a very strange family. The Doctor, Amy and Rory are given the warmest of welcomes by Auntie, Uncle and Nephew. But the beautiful and insane Idris greets them in a more unusual fashion – what is she trying to tell the Doctor? As the Doctor investigates, he unwittingly puts his friends in the gravest danger. And above is a quite spoilery clip. But what if you don't care for Doctor Who or Neil Gaiman or wives? Fear not — there is another option. The Hallmark Channel is airing an original movie, Edge of the Garden, about a workaholic (David Lewis) who discovers he is sharing his garden bench... with a ghost. Rob Estes stars as a man who discovers that "true love blooms in the strangest ways." This is also airing at 9 PM on Saturday, putting you in a bit of a dilemma — how can you watch both this movie and Doctor Who? Maybe your set has one of those "screen inside a screen" things. Or you can DVR one of them. Anyway, here's a featurette thingy. Disney XD is showing the first new episode of Avengers: Earth's Mightiest Heroes in quite some time at 10 AM: "The Casket of Ancient Winters." Fox has its usual animated bloc from 7:30 to 10, with new episodes of American Dad, The Simpsons, Bob's Burgers, Family Guy and the season finale of The Cleveland Show. Incensed over news of Daenerys' alliance with the Dothrakis, Robert orders a preemptive strike on the Targaryens that drives a wedge in his relationship with Ned. A captive Tyrion helps Catelyn, but receives a cold reception at the Eyrie from her sister, John Arryn's widow Lysa (Kate Dickie). Sansa is charmed by the dashing Ser Loras Tyrell (Finn Jones), aka the Knight of Flowers. Arya overhears a plot against her father. At 11:45, there's a new Aqua Teen Hunger Force on Cartoon Network's Adult Swim, followed by a new Superjail! at midnight.